The Google Chrome web browser has updated with a multiple-user profile menu visible in the window titlebar, a feature that makes juggling multiple Google and Gmail accounts extremely easy. It’s also helpful for computers with multiple people using them without multiple accounts too, since anyone can switch logins through the menu. Of course, the user menu switching option is not necessarily useful if you don’t have or regularly use multiple Google profiles, so changing the user menu from enabled by default to being hidden by default is a desirable choice for some users. You may recall that we wrote about this nifty multi-profile ability for Chrome back when it was still a hidden feature in the web browser. It really is great if you use multiple Gmail and Google accounts, but, similar to the Chrome bell icon notification menu, it may be deemed unnecessary for some other users who don’t need or want the feature. 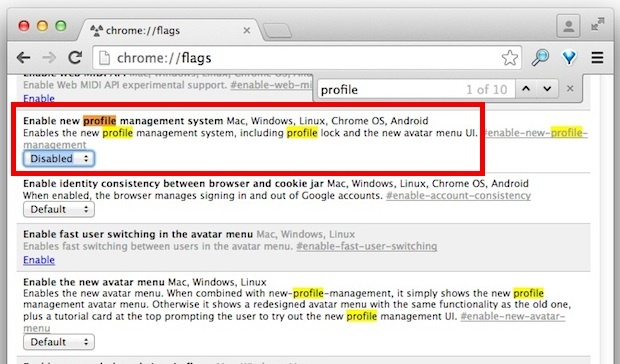 If you want to turn off the multiple profile avatar menu, you’ll need to dig into the Chrome Flags settings, as it’s not in the typical app preferences. This should apply to all new versions of Chrome for all operating systems, whether using the browser in OS X, Windows, Linux, or on a Chromebook. You can always re-enable the setting again if you decide you want to the ability to quickly juggle Google accounts in Chrome, and if you are one of us who has multiple Gmail accounts to keep track of, it’s an incredibly useful feature that you should at least try out. Of course, another option to juggle multiple accounts is to have a new incognito window open with different accounts, or even use different web browsers or different email apps for different Gmail accounts, but if you like to keep Chrome as your default browser, this is a great feature to have natively. Thanks to LifeHacker for the handy tip. Excellent, I’d been wondering how to do this but hadn’t thoroughly investigated it. Thanks for this! I do not understand (actually I think I do :-)) why Google is not placing this option in the regular Chrome settings. Feels like forcing user to work a certain way. Google needs to do something more drastic to address the multiple accounts/multiple identities problem. Many people get into trouble when they accidentally sign up for services and social media sites using their work account vs. their home account, or when the password reset gets sent to an email associated with a company they no longer work for, etc. etc. Plus, I’m sure many of us have created a “throwaway” gmail account, for something like “garagesalethisweekend@gmail.com” and then suddenly you find yourself browsing Google+ and they want that to be your main account? This addition to Chrome is a nice feature, but the system still needs major work. This doesn’t work for me. I have it set as disabled but it still appears in the menu bar. You have to make the the change, the you have to restart Chrome for it to take effect. Cheers! That’s Great. Really annoying feature implimentation, although it may benefit some. Who knows.